A group of bacteria known to occur in treated water may present a health risk to certain susceptible individuals. An article in the December, 2012 issue of Opflow, a journal of the American Water Works Association, describes these microorganisms and how they propagate and provides practical tips for reducing exposure to mycobacteria. The mycobacterium avium complex (MAC) and related bacteria are known as nontuberculous mycobacteria (NTM). As the name implies, NTM do not cause tuberculosis. NTM may however cause pulmonary disease or blood or lymph node infections. According to National Jewish Health, every year approximately two people in 100,000 in the US develop NTM infections. These incidents may be rising in some parts of the country. NTM may cause no symptoms at all or they can cause symptoms similar to tuberculosis, such as coughing, weight loss, coughing up blood or mucous, weakness, fatigue, night sweats and/or lack of appetite. If you have these symptoms and do not know why, talk to your health professional. You may be infected with NTM. According to the Opflow article, those at risk for NTM disease include people with the inherited lung disease cystic fibrosis and the four percent of the US population who carry a single cystic fibrosis mutation. Older people are also at increased risk of infection. NTM are found in natural waters and soils. The bacteria attach themselves to soil particles and interior surfaces of water distribution pipes in slimy coatings known as biofilms. In a recent study, an estimated 40 percent of NTM-infected patients across the US had bacteria in their household plumbing that matched their particular infection, implicating home plumbing. People may become infected with NTM by inhaling fine mists of infected water, such as during showering or when using humidifiers. It is also possible to inhale NTM while working with potting soils. NTM are resistant to common forms of water treatment, such as chlorine, chloramine, chlorine dioxide and ozone. This resistance is due to a biological design in which NTM cells are surrounded by a thick fatty membrane that repels water and prevents contact with disinfectant. 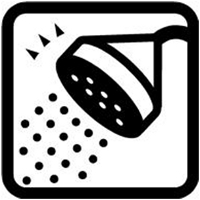 Avoid showering and exposure to the mist that develops in a shower. Substitute bathing for showering and ensure bathroom ventilation to avoid inhaling water mist. Set your hot water heater temperature to at least 130 degrees F (55 degrees C); research shows at least two species of mycobacteria are killed or inactivated by high hot water heater temperatures. This will also reduce risk of MRSA and Legionella. Keep potting soil moist when working with it to avoid breathing soil dust; wear a dust mask to prevent inhalation. As the US population ages, NTM infection rates are likely to increase. According to the Opflow article, the prevalence of NTM-related diseases is increasing at a rate of five to eight percent annually. Understanding how NTM are transmitted helps us develop strategic measures to prevent infection. Communicating these measures will be a growing public health priority. Fred Reiff, P.E., is retired official of both the U.S. Public Health Service and the Pan American Health Organization, and currently lives in the Reno, Nevada area.